I remember, a while back, there was a viral video making the rounds on facebook that outlined the “jobs” of a stay at home mom. It was cheesy, a real heart-tugger, with inspirational music in the background, and it listed several things a stay at home mom is: full time nurse, chef and caterer, maid, counselor, chauffeur, teacher, comedian, pope, Oprah. Maybe not the last two. Maybe yes the last two! If you aren’t Oprah to your kids, who will be? Mamas, listen. We are a lot of things. We wear a lot of hats. Sometimes I’d like to claim that I am a nurse or chef or janitor who caters exclusively to John and Ev, but what happens when they grow up and move out of the house? Am I demoted to “the woman who was formerly a stay at home mom?” Do I fall back on the degrees I earned, most likely twenty-some years ago at this point, and say “all of sudden, I get to be me again. Jennie. Not mom. Just Jennie.” I’ll pick up my pre-kid life, right where I left it at age 25, and it will be like all those years away in the world of motherhood never happened. Being a mother changes you. Physically, there are issues with laughing and sneezing if you birthed your babies yourself. There are new ways for your body to feel tired that you hadn’t previously experienced. Your heart, which until the moment your baby was born was tucked safely inside your chest, now lives on the outside, vulnerable and sticky. Emotionally, you’ve never realized you could love and hate (the word I tell John not to use but is entirely appropriate here) one little human so much and at the same time. Mentally, you may have replaced thoughts about politics and global issues with thoughts about Steve from Blue’s Clues. What is his deal? Does he have a lot of those green striped shirts or does he do laundry daily? What did he go to college to study? How was he accepted into college? Where was his brother Joe for all of those years? 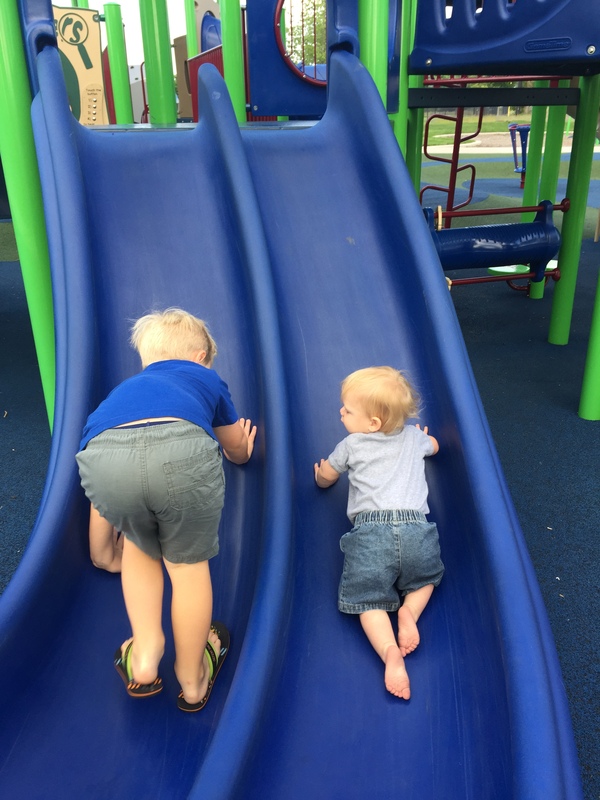 The point is, the journey of motherhood takes the person you were before kids and turns you into a very different version of yourself — but you do remain YOU. Whether you consider your mom-self to be a “chef” or the increasingly popular “re-heater of pre-made foods,” it is entirely up to you to decide how you wear your mom hats. That’s what being premeditated is about. Be intentional and visualize what you want your mom life to look like — and here is the kicker — realistically. I could visualize a mom who is always up at 5:30 and dressed and making pancakes and omelettes before my children wake up, but that is just not going to happen for me consistently. However, I can realistically say, 75% of the time I will wake up before my kids, even if only to pull exercise clothes on instead of pajamas and throw water on my face before wrenching them out of bed. I can plan on homemade, healthy breakfasts most of the time and not feel guilty about the once in a while we have donuts and cereal. To be premeditated as a mama means to be premeditated as a woman. Who are you? Not just as a mom, but as you? Make it a point to figure that out. Write down who you are, own it, and don’t let yourself be ashamed it isn’t the same list as someone else’s. Post Grand Rapids half marathon. 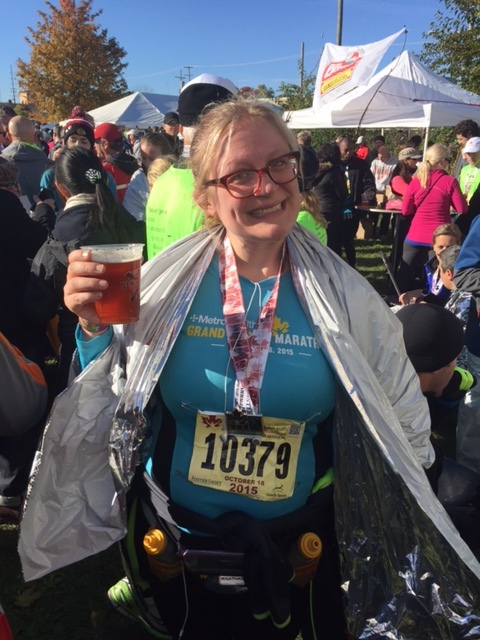 I’d like to say I run to fully experience my life as a mom and strong woman, but it’s largely for free beer and a shiny warmth blanket. This list will change as you and your children age, but keep it balanced with mom-things and not-mom-things. Oh J – I may not be a mom but I have “mothered” children – and I like to think that you are one of them! I am a musician (I admit it), a numbers geek, slightly messy, a late bloomer in the kitchen, a wanna-be athlete. But not a mom (unless you count the canines). Keep writing! Oh it certainly counts! And besides, I’ll be working on an “it takes a village” post in the semi-near future… and you are absolutely positively part of my village! Thank you! Love this, Jennie! As a woman, I have always believed that, for me, I can have it all…. just maybe not ‘all at the same time’. That thought provided me room to enjoy the moment and plan for the future. I have really enjoyed the journey and the balance I found through the support of family, friends, and colleagues.